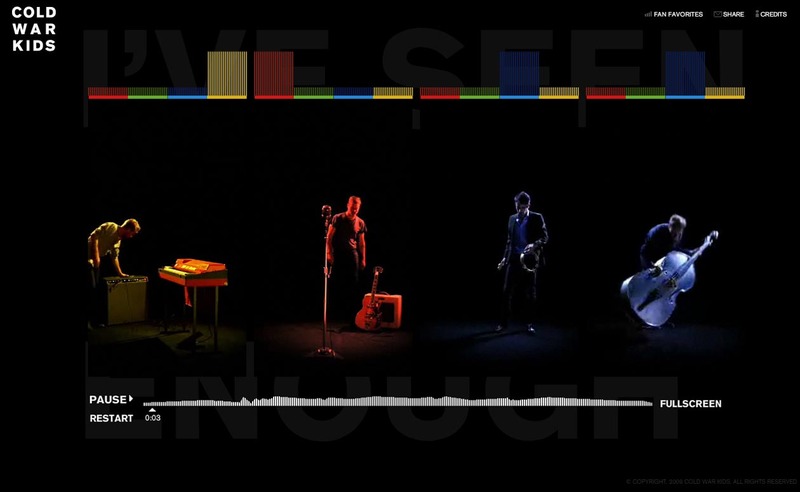 This site was tagged by followers as “the first interactive music video” – it’s a Flash site that allows you to mix different instruments and musicians in realtime as the Cold War Kids’ song plays. Working with Sam Jones and Tool Of NA, the CWK recorded four different versions of their hit I’ve Seen Enough and we videotaped them playing individually so that they could be all mixed together at anytime seamlessly. It was an amazing feat to have this sync up perfectly. It also was the first website that was nominated for Breakthrough Video at the 2009 VMA’s on MTV. .Net magazine also published an article on Jason Nickel and how this site was accomplished.